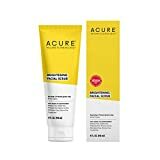 After reading glowing reviews for Acure’s Facial Scrub, designed to be brightening and anti-aging (plus all-natural) during a hunt for the perfect exfoliating product, I was finally sold after a personal recommendation and hearing enough positive feedback. Not only were users posting messages about amazing results, the before and after photos of their skin were incredible. And finding the perfect scrub that doesn’t leave you feeling dry, red, or feeling irritated is tough. It’s also tough to try and make a perfect at home DIY scrub without fuss and mess. With Acure’s Brightening Facial Scrub, there is no DIY fuss or mess, and it’s gentle enough for all skin types, including sensitive and acne-prone. It’s also all natural and plant based (vegan, paraben, and sulfate free), and helps to gently exfoliate dead skin and oil, brighten the skin, and provide anti-aging benefits. One of the coolest things about this scrub for users and the environment? There are no actual plastics or beads. Instead, natural ingredients like lemon peel work to scrub the skin and provide the same benefits. So does it really work? We reviewed so you wouldn’t have to. While I have tested many face and body scrubs with different results, many of them too harsh for my sensitive skin, I was very impressed with the results of Acure’s Brightening Facial Scrub, especially for a product sold for under $10. It looks, feels, and smells like a luxury brand skincare product and gets the job done in exactly the same way, using all natural ingredients, and without drying out or stripping your skin during the process. After my first time using it, not only did my skin appear much brighter and fully clarified, it felt even in tone and texture and was incredibly soft and “silky smooth” As an added bonus, I smelled like light fresh almonds. Even with sensitive and acne-prone skin, the facial scrub was so gentle that it worked at removing all dead skin cells and impurities without creating any dryness, tightness, or redness/irritation. This is probably the first time a scrub has not only left my skin feeling deeply exfoliated, but also nourished and soft after using it. In terms of brightening benefits, there was definitely a difference even after using it once, and an improved glow and radiance. The best part is the price point. I honestly would have paid more for this scrub because it compares to competitors on the market that are sold for 3+ times the cost, and is packed with great ingredients like French green clay, Sea Kelp, and Organic Lemon Peel. After testing this out for the first time, there is no turning back, and it certainly doesn’t feel like a “drugstore brand priced” item. How Do I Use Acure Facial Scrub? 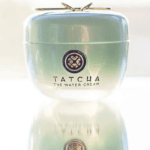 You can apply a small amount of product to a damp face and neck area and gently rub into the skin using your fingertips. You may opt to use this as a weekly treatment but it is gentle enough to use every other day or even every day. For best results, 3 times per week is deal. Follow with your regular skincare routine, like a serum followed by a cream or lotion. Acure’s Brightening Facial Scrub was definitely one of the best scrubs, and most natural, I have ever tried in the category, that left my skin feeling incredibly soft and even in tone and texture. Even after a single use, I noticed very bright skin that was fully restored and clear, and a lack of blackheads and clogged pores. It’s also one of the few facial scrubs I’ve tried that was not at all harsh or irritating on my skin and instead felt incredibly gentle, soft, and smooth during use and after. If you have very sensitive or acne-prone skin (or have used facial scrubs that have not worked for you in the past) or have not used Acure skincare products before, the return and exchange policy in this case may be a highly important factor for you. The manufacturer, Acure, has a strong return and exchange policy that honors full refunds upon dissatisfaction or allergy, and this policy favors the consumer, both new and returning. If you are dissatisfied with the use of Acure’s Brightening Facial Scrub, or if it does not work for your skin to provide suitable skincare, exfoliating, or general brightening/anti-aging benefits, or you experience any product allergy or reaction to the formulation, you may elect to return it at any time. In this case, the formulation of the Facial Scrub was very gentle, definitely gentle enough to use even with very sensitive and acne-prone skin and did not cause any irritation or breakouts, and it is designed to be extremely light for all types of skin, but spot testing is definitely recommended with this product, as with any topical treatment item. Acure Facial Scrub: Worth It For Its Price? Acure’s Brightening Facial Scrub is definitely a bestseller and trending for good reason, and we’d say this is 100% worth it for its price. For under $10, the benefits with use and ingredients used in the formula are highly impressive, and almost unlike anything I have seen on the market before- or at least very rare. With brightening, exfoliating, anti-acne, and anti-aging benefits in one that work for all skin types and is really gentle on the skin, this facial scrub is truly a skincare powerhouse product. While I was a bit skeptical myself considering the low price point, I am so glad to have tried this out after reading the reviews and hearing all of the positive recommendations, as they really proved true. It’s not everyday you can find an all natural product that actually works on the skin and leaves you feeling silky soft and looking glowing without having to shell out a few extra dollars that you’d rather save. We’d highly recommend Acure’s Brightening Facial Scrub for all skin types when you’re in need of a good face scrub that leaves you feeling fresh and looking vibrant. 5/5 and definitely worthy of its hype!